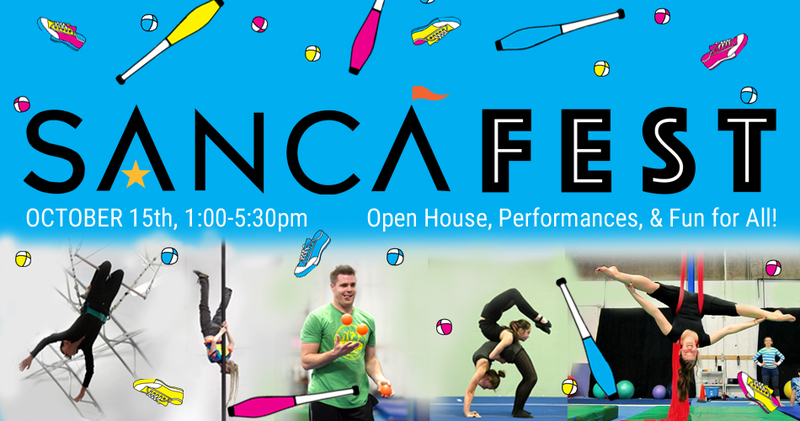 Visit the Google Street View of SANCA and take a virtual tour of our gym spaces, and then cross the street to our School of Flight flying trapeze tent! When SANCA moved to the current location back in 2006, the main gym (with front office, upstairs, and tot room) was the entirety of the organization. 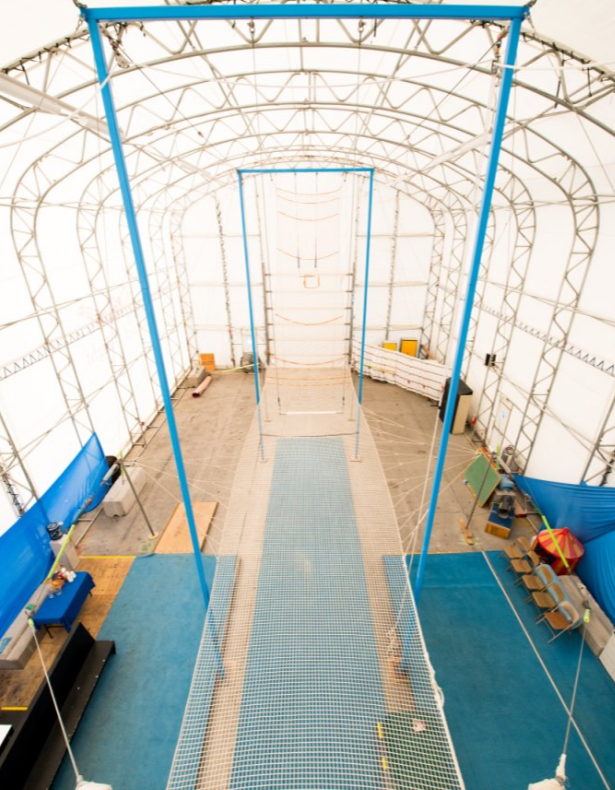 This space originally housed all circus apparatuses: aerial equipment, tumbling floor, trampolines, tight wires, rolling globes, mini tramp, and more. 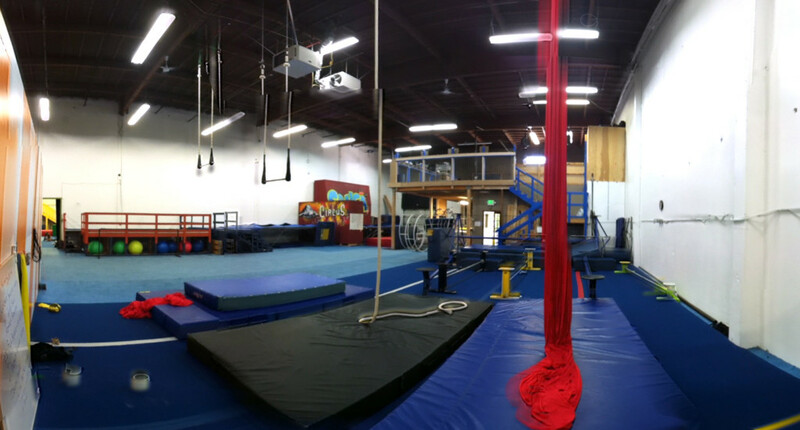 This is a dedicated space for classes for 2 – 4 year-olds with aerial trapeze, rings, and rope, along with balance and tumbling equipment. The South Annex was the first addition to our main space. With its existing balcony and upstairs offices it was a natural choice for a theatre space. A air-sprung Marley floor was added so that dance and Cyr wheel could be practiced. This space now has 8 aerial points as well. The upstairs rooms with their custom murals are great for circus party rooms. Our North Annex spaces house our trampolines, rolling globes, tight wires, unicycles, and juggling equipment, as well as including aerial points. The Little Top is a semi-private space for partner acrobatics, rolling globe, conditioning, contortion, character development and more! Built in 2009, the School of Flight fly tent is a magical escape from gravity. Whether you join us in a class or come to a fly show, a visit to the fly tent will leave you smiling. 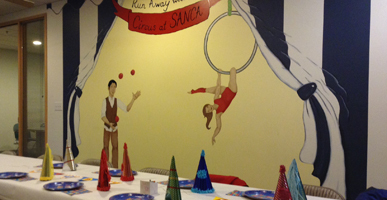 You can celebrate your next big event at SANCA with a circus or flying trapeze party. The circus parties are in our gyms and flying trapeze parties in our tent. Circus parties may include the use of our blue or green party room, both of which include a private bathroom, counter space for all of your snacks and treats, tables and chairs for guests, a small refrigerator, and a perfect party-photo backdrop circus mural.